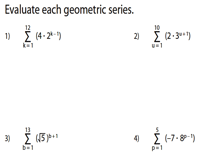 Access this finite geometric series worksheets tenaciously prepared for high school students. 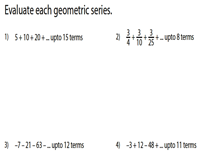 An array of topics, like evaluating the sum of the geometric series, determining the first term, common ratio and number of terms, exercises on summation notation are included. Observe each finite geometric series endowed. Ascertain the first term, common ratio and the number of terms, then substitute in the appropriate formula to find the sum of the geometric series. This Type 2 worksheets require students to find the value of n using the last term of the finite geometric series and find the sum. 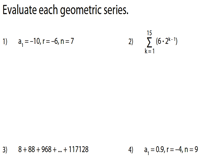 The finite geometric series is provided in summation notation. Plug in the known values in the suitable formula to find the sum of the series. 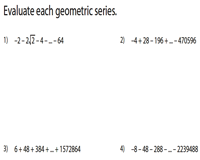 Test your perception on evaluating the finite geometric series with this mixed worksheets. All the three types mentioned above are included. The sum of each finite geometric series is given. 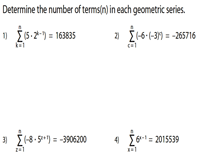 Find the number of terms (n) contained in the geometric series for the given sum. In type 2 worksheets, finite geometric series are expressed in summation notation (also known as sigma notation). 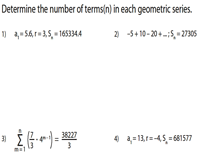 Determine the number of terms using the appropriate summation formula. Recapitulate the finite geometric series that are furnished in various formats. 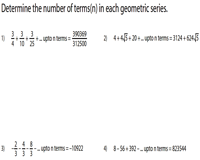 Find the number of terms in the series. 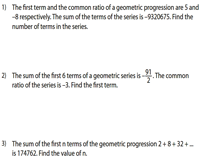 Find the number of terms 'n' and the first term 'a' using the common ratio 'r' and the sum of the geometric series provided. Use the geometric series formula to obtain the value of 'a' and 'n'.